As home values and home equity continues to increase in most parts of California, many homeowners are tapping into their home equity and borrowing cash-out to pay for home improvement projects, tuition for their children, or to consolidate high interest rate credit cards and save money monthly. There are 4 different mortgage programs you can use to refinance and borrow cash-out. Here is how to qualify. There are 4 different mortgage programs you can use to borrow cash-out. The 3 different mortgage programs you can use to refinance and borrow cash-out, are Conventional, FHA and VA financing. Here are their current cash-out refinance rules. 1. Conventional financing allows you to cash-out refinance up to 80% of the property value. Cash-out refinances are available on primary residences, 2nd homes or investment properties. Conventional cash-out refinances also qualify for the new appraisal waiver program, see below. The rate for a cash-out refinance loan is a little higher than a non cash-out refinance. 2. FHA financing allows you to do a cash-out refinance up to 85% of your property value. The interest rate on a FHA loan is the same for a cash-out versus non-cash-out refinance. 3. VA Financing allows you to do a cash-out refinance up to 100% of your property value. The interest rate on a VA loan is the same for a cash-out versus non-cash-out refinance. There is No monthly mortgage insurance on a VA loan even up to 100% of the property value. 4. HELOC (Home Equity Line of Credit). A Home Equity Line of Credit is a 2nd mortgage behind a first mortgage. The payment is calculated using the balance on the loan. This is a good tool for homeowners, as you can borrow against the line of credit anytime you want. Ask me for more details how to qualify. A cash-out or consolidation refinance is a great way to payoff high interest rate credit cards with balances that never seem to move lower. Consolidating credit cards and other personal debts will save the average homeowner up to $300 – $500 a month. A great idea is to reinvest the monthly savings back into the loan to pay it down faster, or you can reinvest the monthly savings back into your 401k retirement fund or a college fund for your children (see below the example). The interest is also tax deductible when you borrow against your home, so once you consolidate all the credit cards with a new mortgage refinance, you can now write off all the interest that you were paying on the credit cards. Check out this consolidation mortgage below that my company just funded for a client. Our client had a rate of 4.25% on a 30 year fixed and had 28 years left on the mortgage. He had 4 credit cards that had rates over 10%. His total monthly payments including the mortgage and 4 credit cards were $2,631 a month. We helped him refinance into a 25 year fixed at 3.99% and paid off the 4 credit cards. His new monthly mortgage payment was $2,009. This saved him $609 a month. Our client is going to put $300 of the $609 monthly savings back into the loan each month to help pay it off faster. By doing this it will pay off the 30-year mortgage in only 20 years (see above). He is also going put the other $300 monthly savings into a college fund for his 2 small children, so he can build a college fund to help pay their tuition costs. After 15 years his college investment fund will accumulate to $133,029 (see above). If you are interested in reviewing a plan like this, just let me know and I can run all the numbers for you. 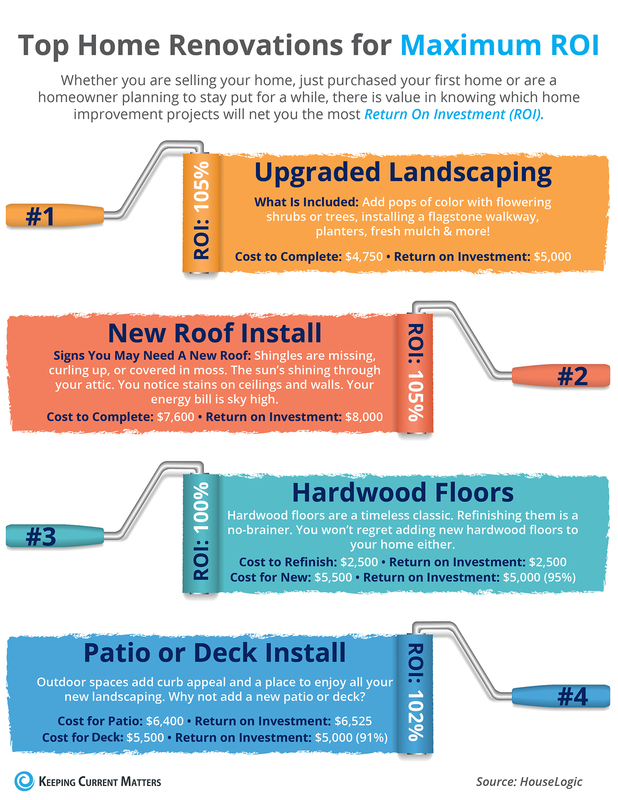 When planning to do renovations to your home, there is value in knowing which home improvement projects will net you the most Return on Investment. Here are the top 4 projects below that will give you the most ROI. Borrow Cash Out to Fund the Down Payment for a New Investment Property. Buying an investment property is one of the best financial investments you can make. With annual rents continuing to increase on average 3% – 4% in many parts of California, and rental vacancy rates at 30-year lows in most parts of California, purchasing an investment property is a great source of additional income. As you can see below, just a 4% increase in annual rent can increase a $1,500 monthly rent up to $1,974 in just 8 years, an increase of $474, which is a 32% profit in rental income for an investment property owner. With interest rates also still near multi decade lows, borrowers can still get a low long term fixed rate on their investment property. This is a good idea so the monthly mortgage payment never changes, but the monthly rent will probably continue to increase, which means the return on your investment will continue to increase over the long term. Many of our clients do a cash out refinance to obtain the down payment funds for a new investment property purchase. Check out HERE the 4 different loan programs available to help you finance and purchase an investment property. The down payment requirements are also included in this article. Fannie Mae is offering “Free Appraisal Waivers” on Conventional refinance and purchase loans. This computerized appraisal will be used to determine the value on a home, instead of having to do a physical appraisal inspection of your home. This will save homeowners $500 out of pocket for the appraisal fee. To determine if you qualify, we just run your loan application through the Fannie Mae conventional automated underwriting system, and their system will determine right away if your property qualifies for the appraisal waiver. This appraisal waiver is available for cash-out and non-cash-out refinances. It is also available for primary residence, second homes, and investment properties. Borrowers just need to have at least 10% equity in their primary residence home to qualify. Ask me for more details how to qualify for the appraisal waiver. If you have some high interest rate credit cards or other debts you would like to consolidate, or you have some home renovation projects you would like to borrow cash-out for, or you would like to borrow funds to purchase a new investment property, just let me know and I can run some numbers for you.